We’ve received this email from a resident, expressing what we believe is probably a fairly common reaction to the election conundrum – who to vote for? With no shortage of evidence pointing to the incompetence of our council, the big question is…. So who do I vote for? For the average person it is impossible to become adequately informed about who stands for what. Are there any candidates with integrity or honesty? Will anyone actually have the will power, knowledge and stamina to repair our failed planning scheme, when the council blames VCAT and VCAT simply insists it is ruling according to the laws of the state? Quite frankly I am convinced our local government is a complete joke, without the laugh. We have experienced first-hand the incompetence and lies coming from their planning and enforcement team who are paid for by my rates. A 3 year saga that left us high and dry. 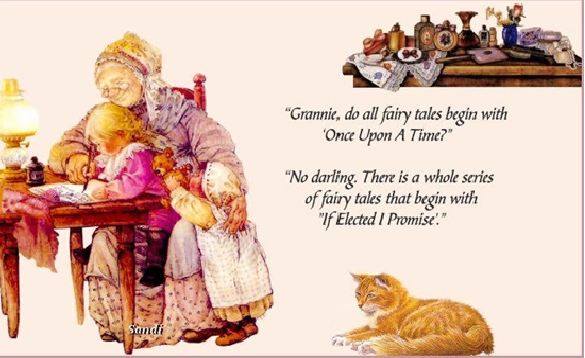 So now it is election time and I want to make my vote count….. yet sadly I think it makes no difference whatsoever. They are all as bad as each other. We do sympathise, whilst acknowledging that sorting the wheat from the chaff, the stooges from the genuine candidates, is going to be a herculean task, especially when each candidate talks in clichés, generalities, and is full of potentially hot air promises. Our position is clear. After more than a decade of in fighting, incompetence, and abuse of power over and over again, it is definitely time for a change. These councillors have done nothing to advance planning, to secure sufficient open space, and to operate in a transparent and accountable manner. Nor have they acted on community aspirations that mean something or done this in a timely manner. Traffic, over development, open space, heritage, community gardens, tree protection are just some of the issues left untouched by this group of 9 councillors. If the responses are nebulous, qualified, or mumbo-jumbo, don’t vote for them! The best example we have of this last statement comes in the form of Ho’s election flyer! At least he has the grace not to mention his opposition to ‘over-development’!!!!!! Shouldn’t be too many stooges since the law was changed two weeks ago. No preferences will be in the voting books. Quite a big change. The Glen Eira Residents Association (GERA) is aware that the feelings of frustration expressed above are widely echoed across the Municipality. Thus, for the upcoming elections, GERA is holding “Meet the Candidates” community forums in each Council Ward. All current incumbents and declared candidates are invited to present at the Forums. The forums are your one and only opportunity to meet more than one candidate in one location and to discuss a range of issues. In the Q&A session, you’ll also get to hear other residents “take” on the issues. 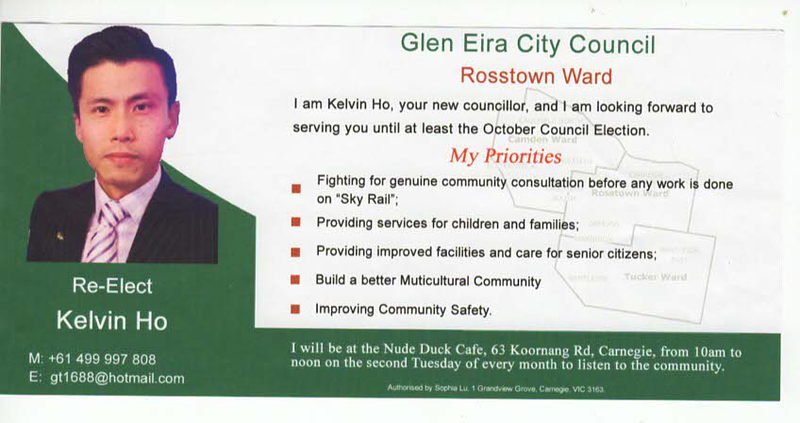 The issues facing Glen Eira are substantial and there is a real opportunity to make a change in upcoming elections. To paraphrase the above resident, the forums make it possible for the average person to find out who stands for what and then cast an informed vote. Gonna be interesting to see which Councillors will show. Unless it’s something Council organizes and controls, all Councillors usually avoid anything like this. It much easier to spread mistruths and avoid being asked questions they can’t answer when it’s one on one. When Ho mentions the community, he means what he thinks is the community is, from what we learn’t from his leaked blogging posts recently is that he doesn’t think Gay people should be included in his definition of community is. His comments in this matter and his following cover-up statements makes him unworthy to be anywhere near our governing processes. His election flyer clearly shows his philosophy is let the developers take the money and run, then let the community bear the cost of providing the services needed to offset living in high rise apartment towers devoid of any amenity or facilities. The promises are piling up. I’ll make everyone feel safe. I’ll keep your rates low. I will protect neighbourhood character and so on. If they can’t define neighbourhood character and how they propose to protect it then they are useless. If they can’t explain what they mean by overdevelopment and how they will stop this they are also useless. If they are clueless about planning then stay clear because they will then do as the officers tell them. If they are genuine they should have done their best to learn about planning and given it some serious thought. I’m fed up with the stupid statements they’ve got on some of their publicity. It means nothing. The cartoon is very apt. Comments too. Ho’s re-election poster is an admission of hopelessness and defeat. His motive can only be that he will stand to redirect his votes to other liberal candidates. In the current lexicon – a stooge that we can be well rid of. How is he going to divert votes to anyone when no preferences will be sent out with the ballot packs. Just the photo and 250 words. Camden looks like a bun fight. All the jewish libs lawyers fighting each other and sounding like pale imitations of Lipshutz or more Delahunty disciples working on gender equality. Will the fair dinkum independents please stand up? Where is Glen Eira’s (MODERATORS: word deleted) Lobo? Why is he not drawing attention to himself? Has anyone heard from him apart from his pictures on coffee shops. There is a rumour that some candidates have complained to VEC that Lobo’s posters on coffee shops do not have the wordings ‘Authorised by him” and he has to replace them. Someone rolling in envy. Who could they be? Some people have really got tickets on themselves. Eight of the nine are standing again at this stage. They must think what a terrific job they’ve done in representing the community. They obviously haven’t read the 2016 Community Satisfaction Survey. Glen Eira Council performance was slammed – even Council describes their results as being significantly lower than the Statewide average. Only thing they were good was garbage both it’s collection and their spreading it. Just heard that some Councillors are telling people not to vote for one Councillor in Children’s and another from Tucker Ward. This is nothing but gutter like behaviour. Just spotted a Pilling poster in a local shop. Making a big noise about him being the past and PRESENT MAYOR. Not much about having achieved anything or his U-turn from progressive to reactionary. Watch for an Esakoff – Pilling preference deal. That should seal it for any voters not aligned with the Liberals. I would hardly ever vote “for” a candidate per se, but attempt to rank them from worst to least worst. Relevant factors include whether they are members of or are aligned with a political party, whether they live in the ward they’re standing for, have any connections with the development industry or other powerful vested interest, past performance in Council if an incumbent, preparedness to advocate on my behalf. Almost certainly I won’t be voting for the incumbents, over their inept handling of planning issues but also because they fight so hard to avoid transparency and accountability. Recent changes to Local Law covering public questions attest to this. The removal of all discretion from the Mayor in handling public questions is pretty damning criticism by his “colleagues”. In an era of Unicode and UTF-8, I wonder what their definition of a “word” is.